Last weekend I took a book binding class, specifically to learn how to make my own journal covers. I love recycling books and will probably still continue to use old book covers, but I'm trying to be more versatile as I search for the perfect watercolor journal. I took the class with Mindy Beloff, at her New York City studio called Studio on the Square. There were two pupils so we received wonderful individual attention. 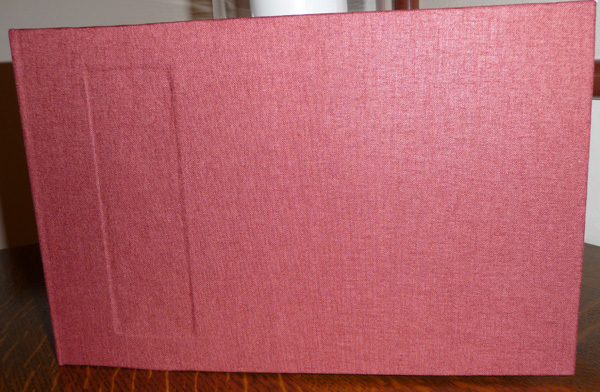 This is the front of the 11" by 7" journal. The indentation on the front can be used to apply a label - or remain as a design element. 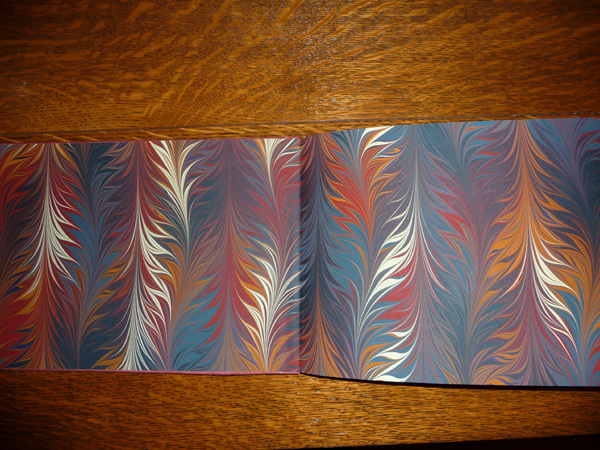 The end papers (shown below) are beautiful, hand marblized paper. There are 4 signatures, each with two folios of Arches 140 lb CP watercolor paper. My recycled books, and instructions for making them, can be accessed by looking at the bookbinding category on the right hand side of the blog home page. The last two days I took a 10 hour case-in bookbinding class at Studio on the Square in New York City. Two of us requested this special wc journal class and left with lots of knowledge and a beautiful book. Although I recycled 7 books for watercolor, I wanted the option of making my own bookcovers and now I can! 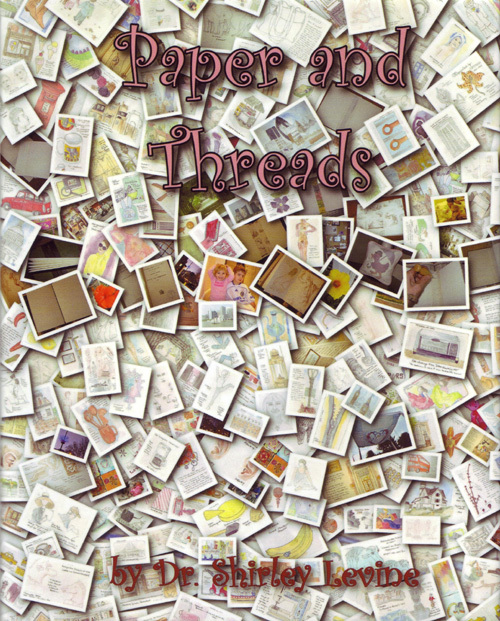 The finished book is 7.25" by 11" and has handmade marblized paper for the endpapers. Will it be too precious to use? I hope not! 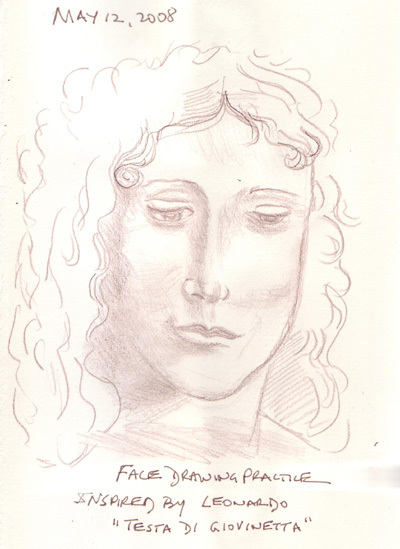 We just returned from a 10 day vacation to Quebec City and Montreal - and I did finish at least one sketch per day - thereby completing my "Every Day in May" challenge. There was a recent discussion on "Everyday Matters" about keeping a travel sketchbook when traveling with non-artists. I will try to mention how I did some of the pages as I post them. But the most important advice is sketch fast and take reference photos to finish the pages later in the hotel or when sitting for coffee, wine. lunch, dinner etc. And have a spouse who enjoys seeing what you are doing as long as he doesn't need to sit for more than 15-30 minutes total. 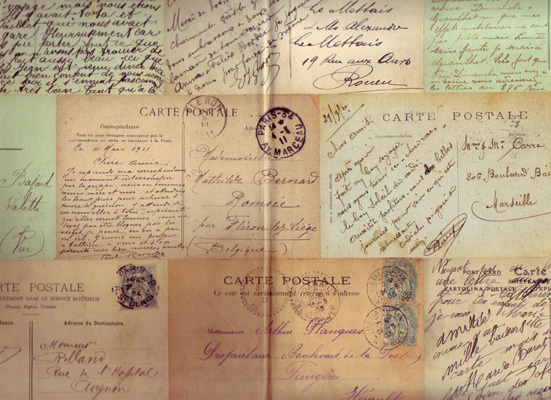 I recycled a Will and Ariel Durant book called Lessons in History for this vacation and used wonderful paper depicting French postcards for the end papers. There are 36 watercolor pages and 8 pages for collage. I will fill the entire book after I sketch the Hockey jerseys we brought back for our 3 grandsons and the princess clothes for our 2 grand daughters on the last 2 pages. I sketched in pen while walking through museums with my husband, just capturing a few of the most interesting pieces. I also did fast sketches (15-20 min)in pencil while my husband did crossword puzzles or went to the gym - and then finished the pages later. I hope to post representative pages over this next week as I continue my vacation at home. 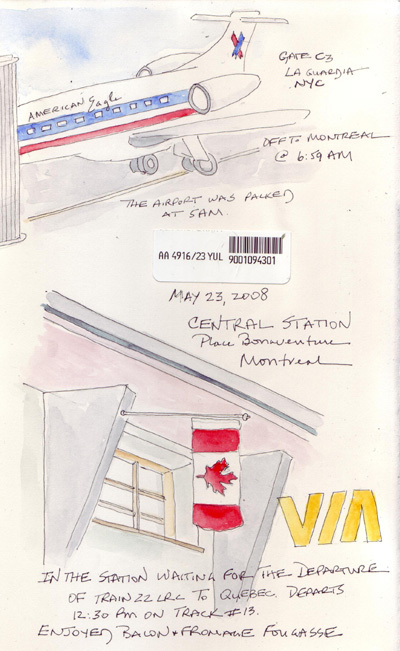 We flew on an American Eagle flight from LaGuardia to Montreal and then took the train (VIA) to Quebec City. I sketched in both the airport and train station to pass the time until departure. 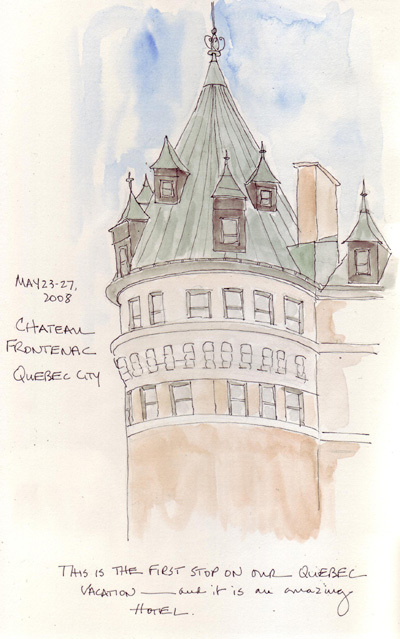 Our hotel in Quebec City was the Chateau Frontenac and I could have sketched only this magnificent building, which dominates the skyline, for the entire 4 days. 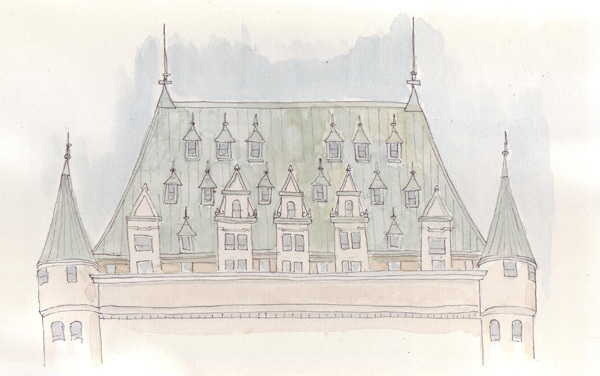 My husband sat with me in the main area of Terrasse Dufferin while I did this pencil sketch of one of the turrets. I went back to the same spot to paint it while he was at the gym late the next afternoon. artist's alley (Rue du Tresor) and after sketching this I realized that everyone of them was of the front side - which is slightly different. Tomorrow - Part 2. The Musee des Beaux Artes and Inuit Art. We are in Quebec City and Montreal for vacation - see everyone in June. 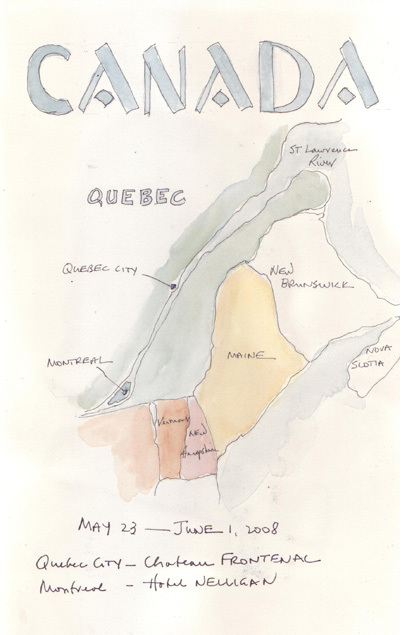 The first page of the recycled book that I made for this trip is a map of Quebec Province and I hope to really play and have fun on every page!